Justice Minister Ayelet Shaked (Jewish Home) urged President Trump Sunday evening to follow through on his campaign pledge to relocate the US embassy from Tel Aviv to Jerusalem, telling Arutz Sheva’s Joe Frager that while Israel ultimately must apply sovereignty to Judea and Samaria as well, recognition of Israeli sovereignty in Jerusalem was a crucial first step. “Just do it,” Shaked said Sunday night at the 35th annual American Friends of Bet El dinner, addressing President Trump. While the Justice Minister noted that ultimately, Israel must apply its sovereignty to Judea and Samaria as well and would hope to see American recognition of that sovereignty, at this stage she would be satisfied with the proposed relocation of the US embassy to Jerusalem. 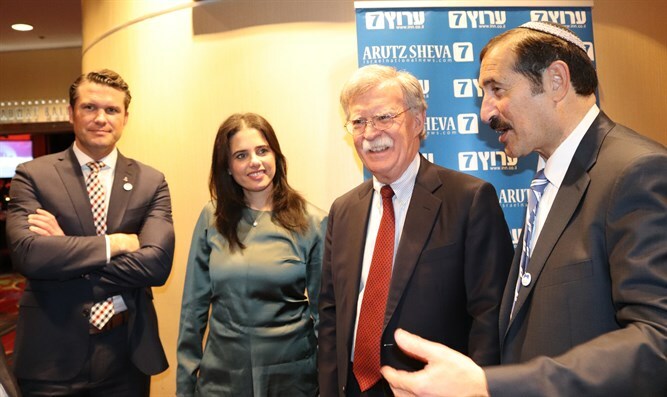 “Our goal is, someday, to apply sovereignty [to Judea and Samaria], but I think that if the president at this stage will just move the embassy, it’s good enough for us. Reports in both the American and Israeli media have cited top Trump administration officials over the past few weeks claiming that the president is eyeing a major change in US policy vis-à-vis Jerusalem. According to the reports, the president is planning to either announce this week the relocation of the US embassy to Jerusalem, or formally recognize the city as Israel’s capital. In 2016, then-candidate Trump vowed to implement the 1995 Jerusalem Embassy Act, which calls for the relocation of the US embassy from Tel Aviv to Israel’s capital city, Jerusalem. Nevertheless, in June of 2017, Trump signed a six-month waiver allowing the embassy to remain in Tel Aviv. Senior US officials claimed that the waiver represented a delay rather than a negation of the president’s campaign promise, saying that the embassy move was just a matter of time. The six-month waiver, due to expire on Monday, must be renewed if the embassy is to remain in Tel Aviv.